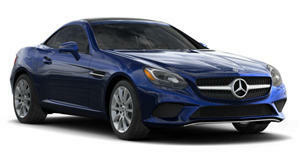 Brabus gets their hands on the new SLK and beats AMG to the market with their new tuning package. Brabus has always had an interesting role in the world of the tri-star. No tuner is quite as thorough when it comes to Mercedes-Benz. This time around, they&apos;ve managed to beat Mercedes at their own game and have come out with a hot version of the new SLK before AMG could release theirs. The tuning package includes a functional aero kit which includes front and rear spoilers, side skirts, running lights and a rear bumper with integrated diffuser. There is a new interior, full of carbon fiber and Alcantara, as well as a set of aluminum pedals. Wheels are available in sizes from 17- to 20-inches. There is an available ECU reprogramming, which is good for between 30 and 50 horsepower, depending on which engine is under the hood. There is also an available high-flow intake and exhaust , and turbocharged models can make use of a bigger intercooler. No word on price.